Most students here know something about the Symposium on Undergraduate Scholarship, but many might not be familiar with what it is or how to sign up to present during the event. The Symposium on Undergraduate Scholarship is a yearly event where students can present any important projects they’ve been involved in as a part of their undergraduate experience. This will be the symposium’s 23rd year at Capital and it is being co-chaired by Dr. Li Feng and Dr. Nicholas VanHorn. “It’s an opportunity for students to share the projects they’ve been working on, either as a capstone project or an independent study or as part of a class … it’s really a celebration,” Stephanie Wilson, the assistant provost for experiential learning, said. Exhibits from last year’s symposium set up in the Cap Center. According to Wilson, the scope of the projects that can be submitted to the Symposium is not limited to traditional research projects. “Scholarship. We use that term intentionally, because we want to capture traditional research experiences, but also anything that is considered scholarship in [any] discipline,” Wilson said. According to Wilson, valid projects for submission can be anything from creative activities to theoretical analyses. The Symposium aims to represent all aspects of the university and student activities. “Our goal is to get as many students to present as possible,” Wilson said. In order to submit a project to the Symposium, students must create a 200 word abstract for their project that describes the purpose, significance, and methodology of their work. More extensive criteria for submissions are listed on Capital’s website. Students can apply to do one of two different types of presentation during the Symposium. 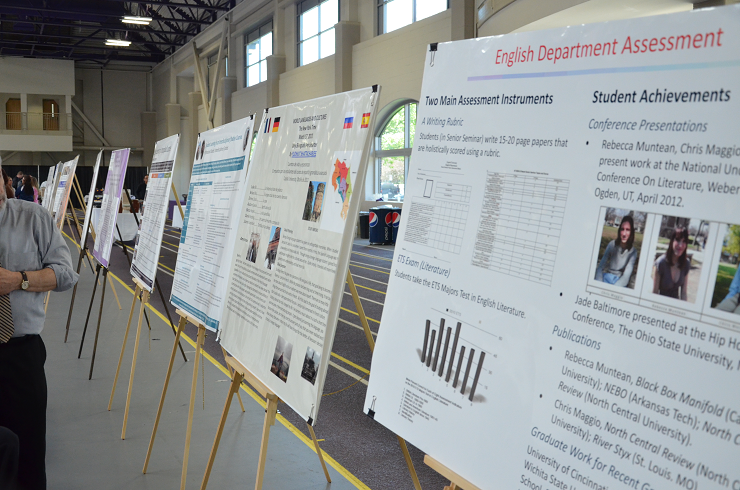 Poster presentations take place earlier in the day during the Symposium and are held all at once in the Capital Center’s Field House. Students presenting must capture their project on a 3-by-4-foot poster that includes information on their experience, and then present that poster to attendees during the event. Oral presentations are conducted in the afternoon. Students are given 15 to 20 minutes to present their work to attendees in any way they wish, depending on their project. According to Wilson, oral presentations are often PowerPoints or paper readings, depending on the discipline the student is attached to. The submission process is the same regardless of what type of presentation the student applies for, and selection for participation in the Symposium is not based upon the type of presentation. For students interested in learning more about composing their abstract before submitting, there will be an abstract writing workshop held in the Convergent Media Center (CMC) Tuesday, Feb. 12 from 4-5 p.m. in CMC 121. The deadline for submissions is March 8 at 5 p.m. More information about the Symposium on Undergraduate Scholarship and the submission portal can be found on the university’s website.